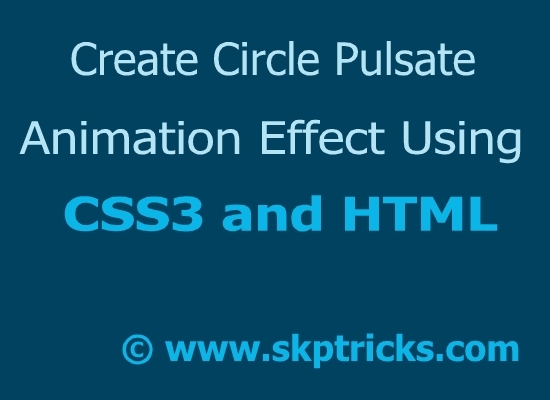 Today we are going to discuss how to create simple circle pulsating animation effect using CSS3. Nowadays most of the websites have integrated similar kind of Pulsating Circle animation effect to their websites. If you are the user of Reddit, Then you may have been observed Pulsate animation effect during the ajax call or new page load. Check out our blog archive on the topic if you’re looking to learn about JQuery Pulsate Animation Effect. Here we have used Keyframe property of CSS3 to provide smooth animation effect to our design. Below is the excerpt from the CSS stylesheet design. Lets see the complete and simple example for pulsate animation effect using CSS3. HTML layout design for circle pulsate animation effect. This is a css stylesheet design for pulsate animation effect. This is all about pulsing circle animation effect using CSS3. Hope you like this simple example. Thank you for reading this article, and if you have any problem, have a another better useful solution about this article, please write message in the comment section.